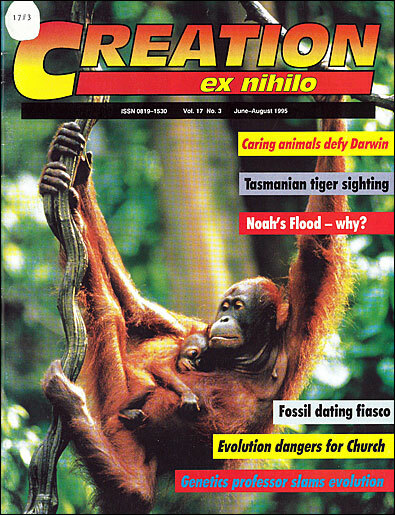 I read with interest your comment in the March-May 1995 issue of Creation, 'Tired of Evolutionary Bias?' I couldn't agree more with the thoughts expressed. As a Christian school staff, we met recently to review material for our library and classrooms. The decision made by the staff was that we would cancel our subscriptions to publications such as Geo and Double Helix because of the evolutionary agenda constantly presented, and double our subscription to a Christ-honouring and scientifically accurate magazine such as Creation. It is the school staff's desire to see this excellent resource available both in the library and as part of regular displays in the classrooms of our school. I encourage other Christian schools to consider using this excellent magazine. The number pi (the ratio of the circumference of a circle to its diameter) was proved to be irrational many years ago. This means it has a non-terminating decimal expansion. In fact, even some rational numbers (fractions) have non-terminating decimal expansions (e.g. 1/3). It has further been proved that pi is transcendental; this means that it cannot be the zero of any polynomial with rational coefficients. The computer program to which the article referred (suggesting that pi is finite) was erroneous. Your editorial and Geoff Meadows' letter (March-May 1995) have prompted me to write on the subject of evolutionist name-calling. Some time ago I began to make a list of the words which evolutionists use against creationists, taken from newspaper and magazine articles and books. They showed a poor spirit indeed. It is not hard to recognize there is something badly wrong in the evolutionary camp. Having read around 40 books by creationist authors I have not seen one resorting to evolution-style ridicule. Instead they treat others with whatever honour is due. On attitude alone the creationist is way out in front, and it shows. I thought that if a specific number was used (as three days and three nights) it meant just that. We cannot read in the Bible anywhere where it is even hinted that Jonah was not a full three days and nights in the big fish (Creation, March-May). I believe that Jesus was at least 72 hours in the tomb, being buried on Wednesday night. In that week there were two Sabbaths (see the Greek of Matthew 28:1). The preparation day the Bible talks about was not the preparation for the weekly Sabbath, but for a special (extra) to occur on Thursday. So Jesus must have been buried on Wednesday afternoon. By early Sunday morning the grave was empty, so Jesus might have risen after sunset on Saturday night, which was for the Jews the first day of the week. I believe that Jesus was buried on Wednesday afternoon and rose some time Saturday night. We enjoy Creation magazine tremendously! Every one of our sons ages 14, 13, 11, 9, 6 can find something of interest to share with the family from your magazine. Reading about Jonah and the great fish brought to mind when I studied first-year zoology at university. We learnt that sharks were able to control their digestive systems—not automatic like ours—and something swallowed was not necessarily digested for days, even a week. When time came for the dissection we had to record the stomach contents of our shark and were reminded it was not unusual to find undigested food because of this control. It certainly made the Jonah story a whole lot more believable, and so stuck in my mind.